date have replaced the original walls. Photo by author. This paper will examine why and how cattle pounds, which date from early English and continental European practice, reappeared in Maine at the end of the eighteenth century. [i] "Pound" refers to an enclosure authorized by the voters of a particular town to keep stray animals until they were claimed by the owner. One of the first pounds in Maine was built in 1793 in Harpswell, a fishing and farming community on Casco Bay where stray cattle[ii] were causing serious damage in unfenced gardens and pastures. Setting up a pound was so urgent that towns took immediate action as soon as incorporation made it legally possible. Pounds were built throughout Maine and colonial America. Then as towns grew larger, as fencing materials improved, and as the laws governing impounding grew more complicated, pounds fell into disuse. 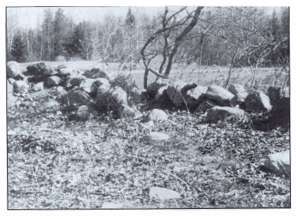 The meets and bounds outlined in Farr's 1910 deed to the inhabitants of Harpswell can be seen today in the stone walls at Harpswell Center which enclose the north, west, and south sides of the burying ground on the west side of Route 123, and in the stone wall which runs northeast from the south corner of the old pound on the east side of Route 123. Actually, the location of the walls that formed two sides and the South corner of the pound still can be determined, although the structures are now ordinary stone walls. The change took place some fifty years ago when most of the large stones were taken by the State Highway Department to fill a marshy place in the road. The start of the third side at the east corner of the pound is shown by a few remaining big stones, while two others at the center of the fourth side were probably part of the doorway. Since the Harpswell Historical Society has been authorized by the selectmen to "bring the Town Pound to the attention of the public for its historic and educational value," volunteers have cleaned up brush and rubbish in the pound. This revealed some of the stones of the other two sides and the south corner. The fifty-four pounds paid to John Roduck indicates two new developments in pound construction: First, the town paid for the work; and second, the structure was to be built of stone, not wood. The stone pound on Harpswell Neck near the Old Meeting House was not built until ten years later, but is still one of the earliest known in the state. The earlier one authorized on Great Island has not been located definitively. Soon thereafter William Dunning, Jr., the town clerk, appointed John Curtis and Nehemiah Curtis Jr., as "two disinterested persons" to estimate the damage done to Alcot Stover by the sheep which he had seized and impounded in the pound on the Neck and [determine] how many of those sheep would be sufficient in value to make up for his losses by their encroaching upon his land. The Curtises reported that Stover had suffered a $3.50 loss. Since the sheep were worth $1.25 each, he should be awarded four of them for his damages and trouble. The brief references in the town reports leave us with a number of questions. For example, what caused pounds, which date back to European Medieval times, to be resurrected in the colonies? How were the early wooden pounds financed? And why were they replaced by stone? For answers, it may be helpful to consider what other Maine towns were doing. All faced similar problems with wandering livestock, and methods of resolving them spread rapidly, thanks to a floating population of teachers, preachers, woodsmen, ship builders, blacksmiths, and peddlers to carry news and ideas from one place to another. Cattle pounds became a widespread feature of the hundred-year transition from exploring, hunting, and wood cutting to farming. When the isolated farm came to have near neighbors, pounds answered an urgent need for protection against stray animals. It is hard, today, to appreciate the impact of cattle grazing in a garden or in the wrong pasture. For families on subsistence farms, the winter's food for both humans and animals was at stake. Moreover, in certain seasons male animals on the loose created another difficulty: it was important for owners to be able to choose what male bred with what female. Gardens were small and the return from fencing them was large, so gardens were fenced early, often by poles simply driven into the ground side-by-side. Pastures were larger; fencing them was difficult and expensive, so some were not fenced. Yet with near neighbors, cattle could easily stray from one pasture to another. At the earliest town meetings there were angry demands for an end to damage by marauding cattle. Towns may have hastened their incorporation partly because the election of pound keepers was apparently accepted as establishing a legal basis for impounding strays. From the beginning several implicit concepts underlie the pound solution to the stray cattle problem: First, the owner was responsible for damage done by his animals; second, it was in the public interest that the person harmed or others should round up and drive offending animals to the pound ‑ originally the pound keeper's barn or farmyard; third, to get his animals back, the owner should pay for damage done. Later, two more concepts were added: the owner was to pay for the cost of feeding and caring for impounded animals, and fines were to be levied on the owner by the town. Eventually, the state legislature incorporated these and other sanctions. When pound keeping in barns and in farmyards became too onerous, towns throughout the District or later the State of Maine authorized construction of one or more log pounds in strategic locations on land loaned for the purpose. No money was appropriated. Trees were there for the felling, and neighbors, no doubt, joined in the common effort, as they did for roads and barns. Later on, more prosperous voters would appropriate money to pay for the work. Then lob pounds were replaced by more secure and permanent stole structures. Pounds had a finite life, related to the development of the community. By 1810 the increased density of coastal towns like Harpswell, the enclosure of pastures and the rise of civic responsibility put an end to strays, hence to the need for pounds. Vienna incorporated in 1802, built a stone pound in 1835 when its stray cattle phase was almost over; it was "not used after 1840." Another factor in the decline of the cattle pound was a steady drop in the rate of incorporation of new towns after the 1830s. (See Table 2.) By then, the colonizing fervor had begun to sour before the reality of remote, unproductive lands. By the 1880s the farming population was in full retreat except in Aroostook County. Farms in marginal areas were being abandoned. Forest, always lying in wait, returned to swallow up fields, stone walls, cellar holes - and an occasional pound. Families and even whole towns went west or to the city, drawn by the promise of better living. [iii] The final blow to pounds came in the 1870s with the introduction of cheap, effective barbed wire. Further evidence of the development and the decline of pounds in Maine comes from legislation passed at the state level. Starting in 1820 when Maine became a state, the legislature was confronted with urgent demands for "curbing stray beasts" in towns that were not taking action on the matter. The legislature responded with seven acts between 1820 and 1846, all approved by the governor. Selections from three of these follow. Still, in this and other acts stone was not specified for the pounds, offering towns an easy way out. The damage done by stray cattle in early farming communities brought forth an age-old response: the cattle pound. Pound keepers were elected at town meetings soon after incorporation, reflecting the urgency of keeping roaming animals out of gardens and pastures. At first, pound keepers' barns, barnyards, or specially built log enclosures served as pounds. Later, towns contracted for massive stone structures with heavy, locked gates, not only to keep animals in but also to prevent owners from "liberating" them without paying costs and damages. Roughly from 1760 to 1860, spreading across the state inland and from south to north, town dwellers quickly experienced the need for pounds. This vanished with better fencing and a denser and more prosperous population, accompanied after 1880 by a steady decline in the number of farms. It is ironic that often, soon after voters could afford to build a fine stone pound, it was no longer needed, for stray cattle had all but disappeared. The legislature, too, failed to understand the transitory nature of the stray cattle problem. To benefit cattle raisers, themselves quitting the state for better pastures in the West, laws were passed imposing such burdensome requirements that impounding became impractical. Fortunately, by then pounds had run their course. [i] The author wishes to express his appreciation to Kirk F. Mohney, architectural historian at the Maine Historic Preservation Commission and to Richard Wescott for bringing pertinent information and statutes to his attention, to the librarians of Bowdoin College and of the Curtis Memorial Library in Brunswick, and to a number of others for suggestions, information and illustrations. A list of some thirty known pounds in the state is available from the Maine Historic Preservation Commission, 55 Capital Street, State House Station 65, Augusta, Maine 04333. The Commission would appreciate further information and pictures in the state. [ii] The term, cattle, was then used broadly for all livestock, a usage followed in this paper. [v] Ibid., Chap. 28 (1821), p. 566. [vi] Public Acts of the State of Maine Passed by the Fourteenth Legislature…January1834 (Augusta: L. Berry & Co., 1834) Chap 4 (1834), p. 219. [vii] Ibid., Chap. 137 (1834), p228. [ix] Samuel Watson, “Anomalies of Fence Law,” Annual Report of the Maine Board of Agriculture (Augusta, 1877, p. 22.